You can separate businesses into three basic categories: Service companies, retailers, and manufacturers. Because companies provide many different services and products to their customers, some companies fit more than one of these categories. For example, restaurants are manufacturers and service companies; they prepare meals and serve them. Some retailers are also manufacturers, selling products that they make. 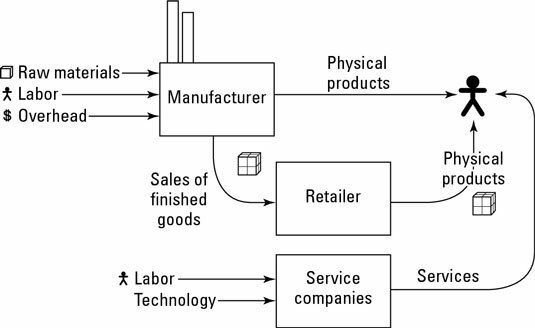 The figure illustrates how manufacturers, retailers, and service companies make and sell physical products and provide services for end-user customers. Service companies that sell or give customers physical products incidental to their basic services don’t necessarily qualify as retailers. For example, even though a university may sell books and supplies, its main business is a service — to educate. Many dentists give toothbrushes and toothpaste to their patients. Even so, dentists really provide a service — treating patients’ teeth. The toiletries are incidental. Because they earn money by providing services to customers, service companies usually rely on having highly skilled workers or some technology that customers value. Accounting firms, universities, hospitals, and dog-walking services must hire trained and well-qualified professionals. Similarly, power utilities and cellphone providers must offer technologies or other services that competitors can’t match. Retailers typically create distribution channels to get their products to customers. For example, an Internet retailer or a mail-order catalog usually packs and ships products to customers. A supermarket, on the other hand, lets customers physically pick out the products they want to buy and then take them home themselves. Retailers must know their customers and the types of products their customers want to buy. For example, a clothing retailer must predict which colors and styles their customers will like in order to buy and stock saleable inventories. To make products, manufacturers need long-lived assets, such as a factory loaded up with equipment, and raw materials — inputs into the production process. For example, an auto manufacturer needs steel; a farm needs seeds. Manufacturers also need labor (that is, employees who work to produce the products), and they have to pay overhead, the miscellaneous costs of running their factories. Many companies manufacture and retail the same goods. For example, mom and pop bakeries usually bake and then sell their own pies. Some oil and gas companies own both refineries (which produce gasoline) and gas stations (which sell that gas). Other manufacturers choose to wholesale their goods to retailers. For example, a soft-drink bottler may produce and bottle fizzy drinks it sells to convenience stores and supermarkets. The soft-drink bottler’s customer — the convenience store or supermarket — retails the drinks directly to end-users.